Käthe Kollwitz is known for her moving depictions of human suffering, especially those caused by the horrors of war. In Berlin's Kollwitz Museum multiple images, including drawings, lithographs, and sculpture, bear witness to her anti-war vision. After training at a women's art college, Käthe Schmidt married Karl Kollwitz, a physician who worked with the poor. She began drawing her husband's patients because she found them ‘interesting and beautiful.’ But soon her work commented on the harsh conditions they faced. 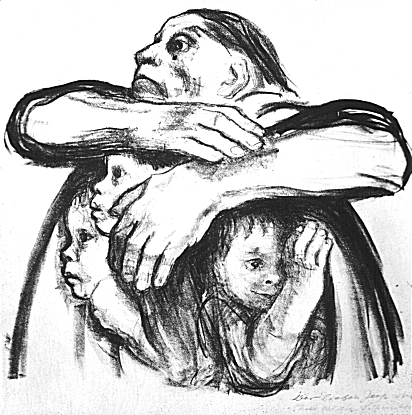 Kollwitz also recognized the deprivations and hardships caused by war, for both soldiers and civilians. WWI took a profound personal toll on Kollwitz, when Peter, the younger of her two sons, was killed on the battlefront. In response, Kollwitz created a memorial called The Father and The Mother – two separate figures in mourning (now displayed at the military cemetery where Peter is buried). She also created a woodcut of herself and Karl called simply Parents. In this image weeping parents lean into each other, forming one figure of grief. Many artists have celebrated the heroics of war in works meant to inspire patriotism and sacrifice. Other artists, notably Goya and Picasso, took a different view, expressing their outrage in paintings of war atrocities. Kollwitz produced many images of mothers trying to protect young boys from conscription. The most famous of these is Seed Crops Should Not Be Pulverized. For her title Kollwitz uses a farming metaphor. The implication is that if all the young men are consumed in war, there will be no future. The mother in this image is Kollwitz. The three young boys may represent her sons and grandson. The mother looks out defiantly at forces threatening the boys. She seems to be sheltering them under her wings, wanting to protect them and knowing it may not be possible. The image evokes the words of Jesus as he entered Jerusalem days before his death. Looking out at the city he said, ‘Jerusalem, Jerusalem, the city that kills the prophets and stones those who are sent it! How often have I desired to gather your children together as a hen gathers her brood under her wings, and you were not willing’ (Matthew 23:37 –NRSV). Jesus said this knowing that Jerusalem would soon be devastated by the Roman army. God is master of the East. God is master of the West. All the northern and southern lands rest in peace within his hands. As an anti-war message the quote reminds us that God is the God of all people, not just one tribe or nation. It also looks forward to a promised time of peace on earth. As a personal reference Kollwitz shows herself being held in the arms of God. No longer struggling to protect loved ones, she is now the loved one, comforted and protected by the everlasting arms. Käthe Kollwitz:Seed Crops Should Not Be Pulverized, 1941, lithograph, 35 x 37,5 cm. Käthe Kollwitz(1867-1945) was born in 1867 in KÓ§nigsberg, Germany. Her father was a stone mason and house builder, who developed strong socialist opinions after reading the work of Karl Marx. It was very important to her father that his children grew up with a sympathy for the plight of the working-class. Her mother was the daughter of Julius Rupp, the leader of the Free Congregation. Both her father and grandfather had a lasting influence on Käthe. In 1881 her father arranged for her to have lessons with Rudolf Mauer, a local copper engraver, and later she could study under the painter Emile Neide. In 1888 Käthe went to study at the Munich Women’s Art School. Käthe gradually began to give up on painting, as she was not able to perfect her painterly technique in the same way that she had mastered drawing and etching. In 1891 Karl Kollwitz, her husband to be, qualified as a doctor and obtained a position in a working-class area of Berlin, where he wanted to serve the poor. They married later that year. In 1892 Käthe Kollwitz gave birth to her first child, a son they called Hans, followed in 1896 by the birth of their second son Peter. Kollwitz's aesthetic and political vision of the working-class man and woman are apparent in The Revolt of the Weavers (1893). The work was exhibited at the Dresden Museum and in 1899 she was awarded the gold medal by the King of Saxony. From then on she was counted among the foremost artists of the country. Kollwitz was especially interested in the lives of women. She often drew the women in her husband's waiting room. When WWI broke out, Käthe's two sons, Hans and Peter, immediately joined the German army. In October 1914 Peter Kollwitz was killed at Dixmuide in Belgium on the Western Front. In the years following Käthe’s work was tainted by his death. She wanted to produce more positive art but found this impossible to do so. ‘How can one cherish joy when there is really nothing that gives joy?’ In 1919 Kollwitz became the first woman to be elected to full professorship at the Prussian Academy of Arts. She began work on a series of lithographs that dealt with the impact of the war on women. In 1924 she produced the anti-war poster Never Again War, in which her anger over the war dominates her sorrow. Kollwitz helped organise a public manifesto in order to combat to rise of fascism. Hitler responded by demanding that Kollwitz should resign from the Prussian Academy of Arts, to which she complied. In 1936 she was arrested by the Gestapo. They wanted to know the names of other German artists who shared her anti-Nazi beliefs. They warned her that if she did not cooperate she would be sent to a concentration camp. She remained silent and because of her age, she was released. In 1938 she finished the sculpture Tower of Mothers. When this was shown at a local exhibition, it was seized by the Nazi government and described as being an example of ‘degenerate art’. Karl Kollwitz, whom the Nazi government had banned from working as a doctor in Berlin, became increasingly feeble and died in 1940. Käthe’s grandson Peter, who was named after her son killed in WWI, joined the German army and was killed during the advance on Stalingrad in October 1942. In 1943 Kollwitz produced her last self-portrait, the last of eighty-four self-portraits, possibly the longest chronology of self-portraits by a woman in Western art. In 1943 her apartment in Berlin was destroyed by bombs. Kollwitz wrote in her journal: ‘Every war already carries within it the war which will answer it. Every war is answered by a new war, until everything, everything is smashed... That is why I am so wholeheartedly for a radical end to this madness.’ She died aged 78 at Moritzburg in 1945. Sharon Gallagher is the editor of Radix magazine and associate director of New College Berkeley. She is the author of Finding Faith: Life-changing Encounters with Christ, PageMill Press, 2001.